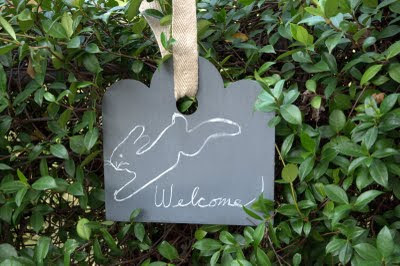 A zinc sign, with a bunny drawn in chalk, welcomes visitors to The Bunny Bungalow. A tiny zinc heart on twine swings in an Indian summer breeze. I adore anything zinc, from the zinc bars of Paris to little zinc accessories from the French company Un Esprit En Plus. 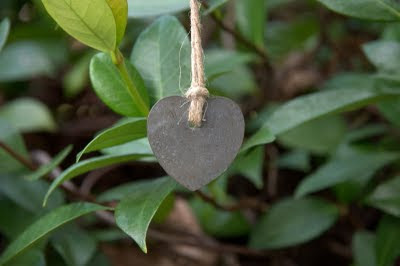 We found the zinc sign and the tiny zinc heart at the garden shop Thompson+Hanson here in Houston. Check out Un Esprit En Plus's delightful website for more zinc treasures. Note: Yaya Chique in Houston also carries French zinc items by Un Esprit En Plus. Don't ya just LOVE these! I have them at the Yaya, but I also have birds and some great heart shapes, tags, etc....I use them throughout the store for signage. Hope you can make it to the shop some day...would LOVE to meet ya! You are right...I need to come to your shop. And I would love to meet the Yaya! OOOO! I love those!!! Just beautiful. Fantastic. I love the bunny. Happy first full day of Fall.